Ford may have created the concept of the postwar American car/pickup, but Chevrolet’s El Camino kept the idea going. Ford’s new full-size car for 1960 was deemed unsuitable for the Ranchero, so it moved to the all-new compact Falcon for 1960. It’s also interesting to note that Ford’s sedan delivery, the Courier, moved to the Falcon platform as well. Another contributing factor for moving it to the new compact platform would be revealed a year later, in the form of an all-new 1961 F-100 with unibody construction like the Ranchero. This way, Ford’s unibody car-based pickup was now sized and priced smaller than the F-100. Structurally and cosmetically, the Ford Ranchero was all but a two-door wagon without the rear roof. This was also why it wasn’t introduced until mid-way in the model year, as it was introduced with the Falcon wagons. Styling changes and powertrain availability marched lock-step between Ranchero and Falcon. An optional 260 cubic inch V-8 arrived during 1963, along with expanding to two trim levels with the addition of the Deluxe model. The first major change in styling occurred for 1964, when the curved body panels became more blocky and incorporated a stamped in side spear body contour. 1964 also saw an additional trim level added, called the Deluxe model, which had bucket seats and was part of the Total Performance marketing theme of all Ford products that year. 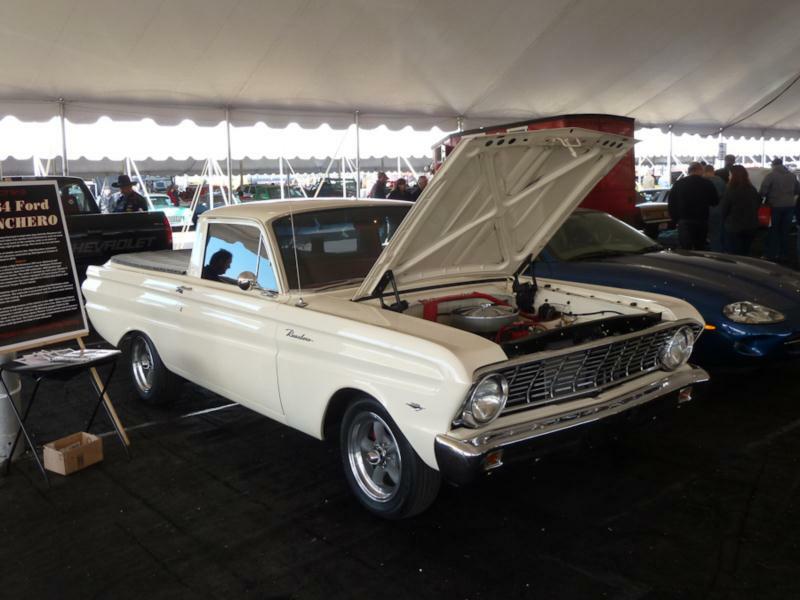 1965 was the final year of the Ranchero on the Falcon platform, and it saw minimal cosmetic changes. Under the hood, however, Ranchero saw the most changes since 1960. The six grew from its original 144 cubic inch displacement to 170, while the V-8 was now the 289 cubic inch unit that premiered in the full-size and Fairlane lines in 1964.